Has this winter (so far) been exceptionally windy? That's been one particularly popular question over recent weeks. Data from NCEP suggests that for the months of November-December-January combined, mean surface winds have been much stronger than normal, especially across southern Britain and the Southwest Approaches - this is, of course, relative to average and does not necessarily suggest that southern Britain has been any windier than elsewhere in the country - Scotland, for example, is more accustomed to stronger winds than areas farther south, so even if it had been equally windy in Scotland and southern England this winter, there would still be a larger anomaly showing farther south where it is often not as windy. The graphic below compares the same period with the previous 2 years, and while not strictly speaking 'winter' (which meteorologically is defined as December-January-February) it does indicate that so far this winter it has been much windier in parts of the country compared to the past 2 winters. Another interesting aspect is that the mean wind direction (the arrows on the maps) highlight that the source of air so far this season has often been from the SW or SSW, i.e. a long fetch of warm, moist air from the Azores or the Canary Islands, and hence why it's often been so exceptionally mild (and damp, or even very wet in some areas). Last winter the mean direction was more of a W or WNW, still relatively mild just not as exceptionally so. 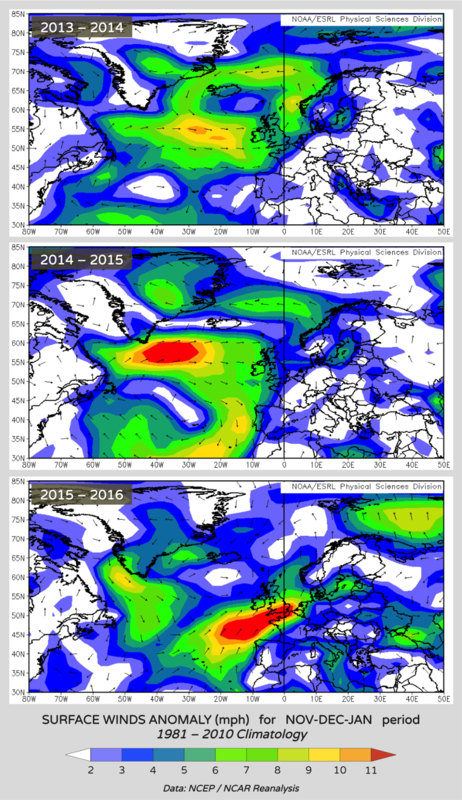 The same also applies to 2013-2014 with a mean W or WSW flow from the Atlantic.